Today we celebrate the Feast of a great Doctor of the Church, Saint Jerome, the 4th century scholar who, at the urging of Pope Damasus, translated the entire Bible from Greek, Hebrew and Aramaic into the language of the Church - Latin. To him we attribute the Latin Vulgate Bible. Jerome was given another gift, that of being able to express the Word in the simplest and most meaningful way and honing in even more on the true essence of all that was written by the prophets and evangelists. Within a short time the people were able to read and understand the "Good News" of the New Testament. Today we proclaim the wise and wonderful Saint Jerome because he has revealed Your loving design by making Your word known. 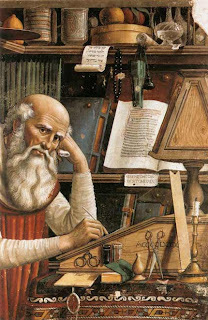 Through Your grace, St. Jerome penetrated Your Divine Revelation so profoundly that from this treasure he could dispense the old and the new wisdom, thus prompting us by his example to seek constantly in the sacred pages Christ, Your living Word. The name Michael means "one who is like God." His will is focused, immovable, and entirely driven toward accomplishing goodness; he is the protector of souls, and wields his powerful sword against the poisonous and vindictive aspirations of he who is known as a liar from the beginning. Gabriel means "God is my strength". He was sent from God to Nazareth, "to a virgin betrothed to a man named Joseph, . . . and the virgin’s name was Mary. And coming to her, he said, ‘Hail, favored one! The Lord is with you’"
Raphael means "God is my health". He is one of seven angels "who enter and serve before the Glory of the Lord." The meaning of Raphael’s name reflects the fact that he touched Tobit’s eyes in order to heal them of blindness. St. Augustine says: "‘Angel’ is the name of their office, not of their nature. If you seek the name of their nature, it is ‘spirit’; if you seek the name of their office, it is ‘angel’: from what they are, ‘spirit,’ from what they do, ‘angel.’" With their whole beings the angels are servants and messengers of God. Because they "always behold the face of my Father who is in heaven" they are the "mighty ones who do his word, hearkening to the voice of his word." Sometimes when defining some spiritual things I just hit a dead end. But recently somebody asked me if I could answer the question, "What's God’s will for you." That’s not an easy thing to do. To take a spiritual concept and place it in human terms is just not easy. How are we humans, the mere dust breathed by God, supposed to determine what God’s will is for us? Maybe by stepping back and taking a closer look at our lives, we can catch a glimpse of the will of God. When I was in the eighth grade I took a test to enter a Catholic high school. 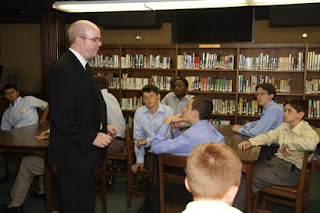 I had visited Chaminade High School in Mineola, NY, which is run by the Marianists. Well, after one visit at the Chaminade Open House I knew where I was going to high school. There was just one problem, I planned and God laughed. It turns out that I was only accepted to Kellenberg Memorial High School, another local, Catholic High School run by the Marianists. To make a long story short, four years later I cannot see myself at any other high school. Kellenberg Memorial is a piece of Heaven on earth for any Catholic student. I have become spiritually involved at Kellenberg Memorial. But that’s not all. I have grown academically and athletically at my school. And when I look back at the last four years, I kind of laugh at it all. And then hit myself on my head and say, “This is God’s will being done.” After four years there I am now thinking about my own religious vocation. 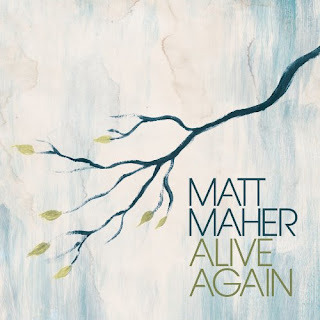 Catholic recording artist, Matt Maher released a new album this past Tuesday, September 22. 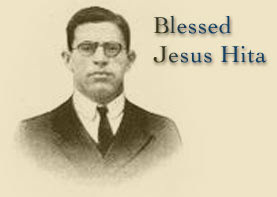 Father Chaminade, too, called each of us to be missionaries, that wherever our journey to Christ leads us, we are called to never cease to proclaim the truth of the Gospel message. “Alive Again” is about waking up to the kingdom of God. It started with a moment driving north towards San Antonio. It was dark. Then it got light outside, but the Sun hadn’t broken the horizon. Yet I could see. It spoke to me of the pre-imminence of Christ - shining around us, helping us see “the light before we see the sunrise” (Colossians 1) - I think one of the main themes of the whole record, really - that He is at the head, and in Him, “all things are held together”. St Augustine of Hippo was an amazing evangelist with a timely story for the church of today to reflect on. 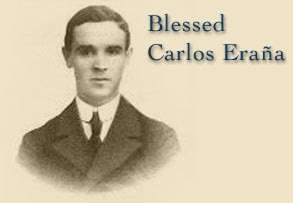 Here’s a guy who went in the world in search of God, but because He didn’t know God, he was led further away from God. I feel like this is a timely truth, because as God is drawing all souls towards Himself, we need to remember and proclaim that Christianity starts with a person and a relationship and moves outward. See, God is relentless in His pursuit of me; and the more I realize it, the more I realize that my journey to Him looks more like His journey to me. That my "pursuit", is really just my waiting and letting Him in. So as you read this - if you feel far off from God, know that the distance between your perception of His nearness versus the reality of it, is strikingly different. He is very near. Sometimes, He's so close it's hard to see clearly. and loyal profession of your faith. assist us with your love and free us from all evils. The martyrs Cosmas and Damian were executed in the city of Cyrrhus in Syria about 303, during the persecution decreed by the Roman Emperor Diocletian. Other facts about their lives are uncertain. An early legend suggests that they were twin brothers born in Arabia who became skilled physicians. As Christian doctors, according to the legend, they charged no fees of those they healed or cared for; they were thus called “the holy moneyless ones,” and along with St. Luke (the “beloved physician” mentioned by St. Paul in Col 4:14), Cosmas and Damian are considered the patron saints of physicians. Within a century of the deaths of Cosmas and Damian, their fame had spread more widely than that of most martyrs, and perhaps as early as the sixth century their names were added to the Roman Canon. our life for the salvation of souls. Love conquers death!”. "A university or school’s Catholic identity is not simply a question of the number of Catholic students. It is a question of conviction – do we really believe that only in the mystery of the Word made flesh does the mystery of man truly become clear (cf. 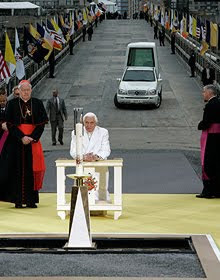 Gaudium et Spes, 22)? Are we ready to commit our entire self – intellect and will, mind and heart – to God? Do we accept the truth Christ reveals? Is the faith tangible in our universities and schools? Is it given fervent expression liturgically, sacramentally, through prayer, acts of charity, a concern for justice, and respect for God’s creation? Only in this way do we really bear witness to the meaning of who we are and what we uphold. ...Fostering personal intimacy with Jesus Christ and communal witness to his loving truth is indispensable in Catholic institutions of learning." 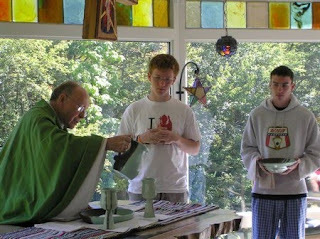 Our three retreat houses offer programs that foster personal intimacy with Christ. In the spirit of Blessed Chaminade we hope to create a "people of saints." 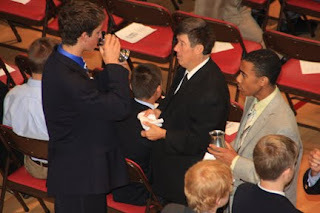 Above, Father Philip prepares the gifts at the Eucharist for the Senior Leaders in the Founders Hall Chapel. Above Brother Joseph presents some guidelines for this year's teachers in the PREP program. Finally, Brother Ryszard leads an engaging discussion with this year's teachers of PREP. Yesterday we began our annual Wednesday XLT (EXALT) Worship Service from 6 p.m. - 8 p.m.
Well over 175 students attended the program which focused on the theme of vocations. Our guest speaker was Msgr. James McDonald who spoke about Extraordinary People for Extraordinary Times. Do you have a love for God? Do you love for your neighbor? Do you have a generous heart and a willingness to sacrifice? Do you have a sense of joy and peace with the Church? Why not respond to Christ who is calling you? Respond with your whole heart, mind, and soul. Our evening ended with Adoration of the Blessed Sacrament and Benediction. Finally all sang the Divine Praises and the Marian Antiphon Salve Regina. May the Father, and the Son, and the Holy Spirit be glorified in all places through the Immaculate Virgin Mary. Today we celebrate the feastday of Saint Pio Pietrelcina. Saint Pio's canonization miracle involved the cure of Matteo Pio Colella, age 7, the son of a doctor who works in the House for Relief of Suffering, the hospital in San Giovanni Rotondo. On the night of June 20, 2000, Matteo was admitted to the intensive care unit of the hospital with meningitis. By morning doctors had lost hope for him as nine of the boy's internal organs had ceased to give signs of life. 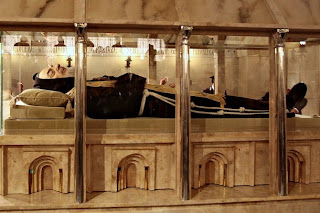 That night, during a prayer vigil attended by Matteo's mother and some Capuchin friars of Padre Pio's monastery, the child's condition improved suddenly. When he awoke from the coma, Matteo said that he had seen an elderly man with a white beard and a long, brown habit, who said to him: "Don't worry, you will soon be cured." "I bless you, Father, Lord of heaven and earth, because ... these things ... you have revealed to little ones" (Mt 11,25). How appropriate are these words of Jesus, when we think of them as applied to you, humble and beloved Padre Pio. Teach us, we ask you, humility of heart so we may be counted among the little ones of the Gospel, to whom the Father promised to reveal the mysteries of his Kingdom. Help us to pray without ceasing, certain that God knows what we need even before we ask him. 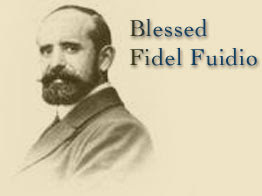 Obtain for us the eyes of faith that will be able to recognize right away in the poor and suffering the face of Jesus. Sustain us in the hour of the combat and of the trial and, if we fall, make us experience the joy of the sacrament of forgiveness. Grant us your tender devotion to Mary, the Mother of Jesus and our Mother. Accompany us on our earthly pilgrimage toward the blessed homeland, where we hope to arrive in order to contemplate forever the glory of the Father, the Son and the Holy Spirit. Amen." Someone shared this quote with me about the meaning of vocation and it seems to me to be an excellent explanation. "God calls all the souls he has created to love Him with their whole being, here and hereafter, which means that He calls all of them to holiness, to perfection, to a close following of Him and obedience to His will. But He does not ask all souls to show their love by the same works, to climb to heaven by the same ladder, to achieve goodness in the same way of life. What sort of work, then, must I do? Which is my road to heaven? In what kind of life am I to sanctify myself?...This question: "What kind of life am I going to undertake?" is the question of vocation...There is therefore a very grave duty for each one of us when we reach a certain age to take the most careful trouble to find out what vocation we have to follow. This vocation is God's call to undertake such-and-such a sort of holy life in preference to all others, His urgent call to each and individual soul to sanctify itself in this particular way. There can never be any question of choosing a vocation: the word 'choice' is excluded by the word 'vocation,' which means 'calling,' a call from God." In the mind of Blessed Chaminade, our first duty toward Mary is to learn the relation of Mary to God and to ourselves. This is our task with the students we encounter each day. We share our devotion to Mary with our students. As Marianists, our study and knowledge of Mary are of prime importance. "As it is through our knowledge of our Savior Jesus Christ that we have come to know the most Blessed Virgin, so also may we say that it is our knowledge of Mary that leads us to know our Lord Jesus Christ." This weekend two Marianist Brothers travelled to Franciscan University at Steubenville for the annual Vocation Awareness Day on campus. Held in the university fieldhouse, religious orders and diocesan vocation directors spent the day talking to discerning college students. 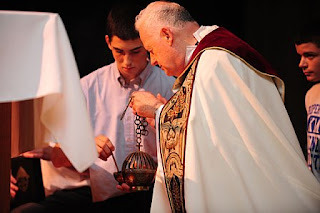 On Saturday, Father Michael Scanlon, TOR preached at the Mass in Christ the King Chapel to a over crowded chapel. His homily focused on the word vocation. Vocation is a call to follow and what God calls you to do with your life. 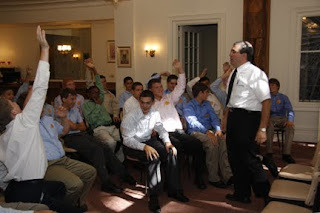 Hundreds of college age young men and women visited the tables and shared their interest in priesthood and religious life. 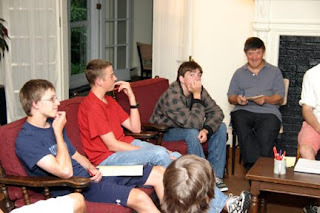 Throughout the day Brother Stephen explained and answered questions about the Marianist way of life. He shared his joy of being a Brother ! I’d like to spend today reflecting on the theological virtue of hope. My thoughts are occasioned by the chapter on hope in a book that I have been using for spiritual reading. 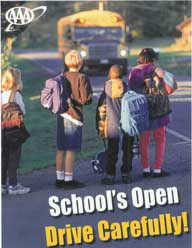 The book was written by William Mattison, a Chaminade graduate of the Class of 1989. Bill is now a professor of theology at Catholic University. Perhaps I might illustrate the virtue of hope by means of a concrete example taken from one of my annual summertime activities – painting. I’m not talking about canvases, landscapes, and portraits. No, I’m referring to our annual maintenance work around our schools and retreat houses. We paint ceilings, walls, doors and doorframes, fences, concrete floors – just about any surface that needs sprucing up. In many cases, we’ve painted the same surfaces three and four times since I joined the Society of Mary some thirty-five years ago. In fact, I can think of a few classroom walls that we paint year after year, without fail. No matter how fresh and clean those walls look for the start of school in September, they are covered with ink marks – most of them careless, a few of them deliberate – every June. Much in the world at large – the macrocosm, if you will – militates against hope and prompts despair. The same can happen in our own little worlds as well, even in matters as small and seemingly insignificant as painting, maintenance, and repair. Still, we go on repainting and repairing – not in the naïve belief that, this time around, those nasty ink marks wouldn’t dare reappear. No, we repaint and repair because we hope to teach respect for property, respect for one another, and respect for the good things of this earth that God has given us. And we believe that many of our students learn those lessons of mutual respect from our simple witness to maintenance, repair, and manual labor. More than a few get the point – some now, some only years later. 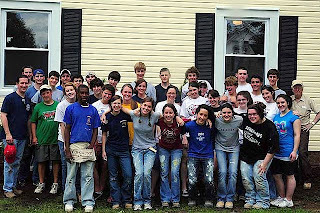 This summer, several of us have had the privilege of helping to renovate a 103-year-old house that Catholic Charities will soon be using to care for unwed mothers and their babies. 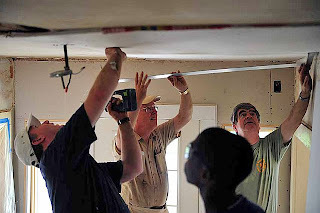 Many Marianists and lay volunteers – adults and students alike – have contributed their “specialty skills” to the project, from carpentry and plumbing to painting, electrical work, and landscaping. We have done all this work, not out of some naïve belief that this little, localized project of ours will put an end to abortion in this nation. No, we have done so in order to support those brave young women who have decided to bring their babies into this world, despite all the difficulties involved in an unintended pregnancy. We have done so, not because we think we can change the world, but because we hope to at least make a difference. Our hope springs from our faith in God and His goodness. His unbounded love for us engenders our love – however imperfect – for all His people. That’s not a bad way to consider the virtue of hope. Hope inspires us to unite our “one candle” with the candles of all the hopeful of this world and, even more, with the source of all goodness and light, the God who is in heaven and at our very side. With Julian of Norwich, we trust that, in God’s good time, “all shall be well . . . and all manner of things shall be well.” In the meantime, we believe that many things on this earth can be well, if we unite our one candle with millions of others and with the eternal flame of God’s love. And all of this takes root in what my friend and former student has called the “virtue for the wayfarer,” namely, hope. Nothing in 21st century American usage sums up the apathy and lack of enthusiasm of so many as the one-word response, “Whatever.” It has become an all-purpose response that takes the place of “I don’t know” and/or “I don’t care” or “Don’t bother me” and “It just doesn’t matter.” You can’t walk down the school hallway at change of classes without hearing it used. As Jesus’ first and model disciple, Mary’s statement to the waiters at Cana is also addressed to us. Her instruction calls for enthusiasm and openness to new things. Are we listening for Jesus’ plan for our lives? Are we eager to do His will? Whatever it is? 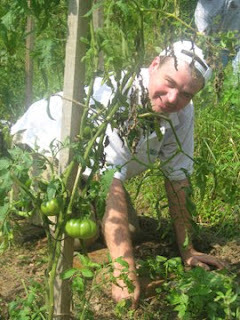 A week or two ago one of our students organzied an irrigation installation at Queen of Peace Residence in Queens Village. At the entrance canopy of the home for the elderly are fifteen hanging baskets. No longer do the Little Sisters of the Poor need to worry about watering those plants. This new watering system will automaticly keep the plants moist. The only catch is the battery needs monthly replacement. The water piping is quickly installed in the picture taken from the roof of the canopy. Above Scout Dom Resca poses with the Little Sisters and a relative of a resident. On October 11th the Foundress of the Littles Sisters of the Poor will be canonized in St. Peter's. Three of our Brothers will attend the Canonization Ceremony of the foundress who will be proclaimed as Saint Jeanne Jugan. Yesterday on the Feast of the Exaltation of the Holy Cross we gathered as a school community to pray and re-dedicate ourselves to Christ. Under beautiful skies, over 2500 Kellenberg Memorial students and all of St. Martin DePorres Marianist School assembled around the large crucifix in front of the school. Joining us were arents, grandparents, relatives and the Little Sisters of the Poor. Senior Connor McManus read the first reading from St. Paul. Father Thomas preached a homily filled with motivation and inspiration . Jesus asks us to die to the self. Jesus tells us that our cross will always lead to the transformation of our lives. In a similar manner Thomas a' Kempis reminds us, "The cross, therefore, is always ready; it awaits you everywhere. No matter where you may go, you cannot escape it, for wherever you go you take yourself with you and shall always find yourself. Turn where you will --above, below, without, or within -- you will find a cross in everything, and everywhere you must have patience if you would have peace within and merit an eternal crown. If you carry the cross willingly, it will carry and lead you to the desired goal where indeed there shall be no more suffering, but here there shall be. If you carry it unwillingly, you create a burden for yourself and increase the load, though still you have to bear it. 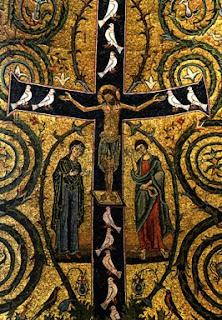 If you cast away one cross, you will find another and perhaps a heavier one"
"True wealth, true glory, true joy is to be found in the cross. Happiness is necessarily linked with the cross since Jesus Christ declared this truth. But we look upon such truths as impenetrable mysteries. This is a temptation of the devil, to prevent us from pondering over them, because upon examining the cross of Christ, we would find it lovable and worthy of our embrace." Let us link ourselves with the Cross of Christ! Rediscover the Cross of Christ. Let our faith embrace the Cross! The Cross of Christ does not crush us, but exalts us! through the Immaculate Virgin Mary. Amen. Bestselling author Scott Hahn, a convert to Catholicism, spoke to over 1,100 in our Kellenberg Memorial Auditorium yesterday. "the "how and why" of the Catholic faith—drawing from Scripture, his own struggles and those of other converts, as well as from everyday life and even natural science. Hahn shows that reason and revelation, nature and the supernatural, are not opposed to one another; rather they offer complementary evidence that God exists. But He doesn't merely exist. He is someone, and He has a personality, a personal style, that is discernible and knowable." He showed, "that God created the universe with a purpose and a form—a form that can be found in the Book of Genesis and that is there when we view the natural world through a microscope, through a telescope, or through our contact lenses." Finally, at the heart of his talk was Hahn’s examination of Mary deliberately depicted as the Ark of the Covenant, as Queen Mother, as one to whom we give glory! For us Marianists, today is our Patronal feast day! For Blessed Chaminade this feast definitely was central to his spirituality which influenced all of his writings and his foundations. It is for the honor and glory of Mary that we Marianists pronounce our vows to God and take on the mission of Mary bringing Jesus to today's world. "God, in the wisdom of his counsels, predestined Mary from all eternity to be the Mother of the Savior of the world, to be the instrument of the Incarnation, which is the universal principle of grace. This choice is a gift of God and infinitely glorious for Mary. But the gifts of God are irrevocable, hence this choice will remain forever. All the graces received by us are merely applications or outcomes of the grace of the Incarnation." May all the members of the Marianist Family rejoice and celebrate as we honor Mary our Mother and learn from her to say "Yes"-- "Let it be done to me according to your word.” Amen. who gather today at this site,the scene of incredible violence and pain. Our hearts are one with theirs as our prayer embraces their pain and suffering. among nations and in the hearts of all. Amen. Music moves us. It stirs our minds. It stirs our hearts. We fix events in our lives by the music that was playing during those times. As a college student, the music of Jimi Hendrix gave me a rush. I can pin my trips to graduate school on the music of Carol King. While I was removing the pipe organ from a Queens Village movie theatre, the music of Jerry Rafferty helped me pluck those diapasons and tibias from the old place. Yes, music has an evocative power. Even horn-honking students on their way past school have been heard singing St. Louis Jesuits music -- “Sing to the Mountains . . .” Music really does stick in our minds and hearts. As we head back into the classroom for another year, it is good to remember that we are called to love our students and classmates with the same kind of selfless love that Jesus showed to those He taught and interacted with. We must expand the circle of our love and concern to include even those we might not naturally be drawn to and those who we might think are not interested. When functioning right, the classroom, like the religious community, becomes a “schola amoris” or school of love. The classroom is a School of Love, for young people and adults - a school in which all learn to love God, to love our brothers and sisters with whom we interact everyday, and to love humanity, which is in great need of God's mercy and of fraternal solidarity. When a classroom is a Schola Amoris, which helps one grow in love for God and for one's brothers and sisters, it is a place for human growth. In our Communities, the birthday of every Brother merits a celebration. The Brothers gather to wish congratulations and best wishes. There are cards, a favorite meal, song, candles, cake and even balloons on occasion. So, it is for the people of God and Mary. give your people help and strength from heaven. The birth of the Virgin Mary's Son was the dawn of our salvation. bring us closer to lasting peace. Your Son, who lives and reigns with You and the Holy Spirit. Amen. Blessed Chaminade embraced the ideal of a “family spirit,” of religious and lay persons, faculty and students, working together to achieve lasting relationships of friendship and trust, supporting and challenging each other in developing their mutual gifts. For the Province of Meribah our schools are communities of faith. Blessed Chaminade saw clearly that its leaders, religious and lay, must see their work not merely as a job but as a ministry of love and service. Words have also supernatural power. The words a husband and wife exchange on their marriage day have power. The words a religious proclaims on the day of first profession have power. The words of Christ at the Last Supper, "This is my body; this is the cup of my blood," makes Christ's Real Presence in the Eucharist possible. What about us? 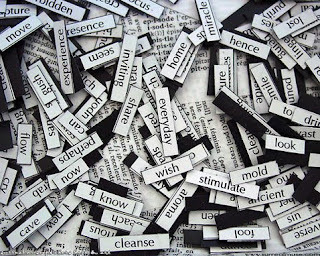 Do we realize that our words are powerful? Do we us words to heal? Can we hear each other’s words? Are our lives so full of events and noise that we can't hear God? Today we see the seemingly strange gesture that Jesus did with the deaf-mute as a symbol of the sacraments thanks to which he continues "touching" us physically to heal us spiritually. This week, make a deliberate attempt to choose your words deliberately. Realize that the Eucharist helps us overcome the inability to communicate with our neighbor, making us possible to experience the most wonderful communion with God. Today, Marianists worldwide celebrate the Feast of Mary, Queen of Apostles. Our feast honors the Queenship of Mary and also her mission to make Jesus known, loved, and served. Mary is Queen of Apostles because she is full of grace. Mary is Queen of Apostles because she is the creature most intimate with God. Mary is Queen of Apostles because she gives Jesus to us and helps us to love him. Mary is Queen of Apostles because she formed the Apostles and directed them in their preaching. Mary is Queen of Apostles because she is mother of grace and channel of mercy. Mary is Queen of Apostles because in her every hope is life and virtue. On this day in 1818 the first Marianists, publically professed vows of poverty, chastity, and obedience. As a community of faith united to the person of Jesus Christ, the Brothers affirm a special devotion to His Mother, Mary, the first disciple. Because of her fiat we cherish the Blessed Virgin Mary as a precious model and strive to imitate her disposition to service and her habit of contemplation. In prayer we keep all things in our heart which the Redeemer suggests to us when we seek Him, just as our Blessed Mother did. In our places of ministry and apostolic work, we strive to form men and women more fully in the image of Her Son. In our enthusiasm for our work, in our devotion to prayer, and our hospitality towards others, we seek to be like her so that we might also become like Her Son. Applied to education, this spiritual focus is reflected in the five Characteristics of Marianist Education below.